Rabindranath Tagore was the first person of Indian origin and also first Asian to be awarded with the Nobel Prize. He received the prize for Literature in 1913. The Nobel Prize is a set of annual international awards bestowed on "those who conferred the greatest benefit on humankind" in the fields of Physics, Chemistry, Physiology or Medicine, Literature, Peace and Economic Sciences,[A] instituted by Alfred Nobel's last will, which specified that a part of his fortune be used to create the prizes. Each laureate (recipient) receives a gold medal, a diploma and a sum of money, which is decided annually by the Nobel Foundation. The Royal Swedish Academy of Sciences awards the Nobel Prize in Physics, the Nobel Prize in Chemistry and the Sveriges Riksbank Prize in Economic Sciences in Memory of Alfred Nobel; the Nobel Assembly at the Karolinska Institute awards the Nobel Prize in Physiology or Medicine; the Swedish Academy awards the Nobel Prize in Literature; and the Norwegian Nobel Committee awards the Nobel Peace Prize. They are widely recognized as one of the most prestigious honours awarded in the aforementioned fields. First instituted in 1901, a total of 904 individuals (852 men and 52 women) and 24 organizations were awarded the Nobel Prize between 1901 and 2018. Among the total recipients, 12 are Indians (five Indian citizens and seven of Indian origin or residency). Rabindranath Tagore was the first Indian citizen to be awarded and Mother Teresa is the only woman among the list of recipients. Notably, Sri Aurobindo, the Indian poet, philosopher, nationalist and developer of integral yoga, was nominated unsuccessfully for the Nobel Prize in Literature in 1943 and for the Nobel Peace Prize in 1950. On 1 December 1999, the Norwegian Nobel Committee confirmed that Mahatma Gandhi was nominated unsuccessfully for the Peace Prize five times (from 1937 to 1939, in 1947 and a few days before he was assassinated in January 1948). In 2006, Geir Lundestad, the Secretary of Norwegian Nobel Committee, cited it as "the greatest omission in our 106-year history". The following are not Indians, but rather Nobel laureates born in British India or laureates who are of Indian origin but subsequently non-citizens of India; however, they are still often included in lists of Indian Nobel laureates. The following are Nobel laureates with Indian linkages – foreigners who were born in India, those who are of Indian ancestry and those who were residents in India when they became recipients of the Nobel Prize. ^ The Sveriges Riksbank Prize in Economic Sciences is an addditional prize that was established in 1968 by the Bank of Sweden and was first awarded in 1969. Although not technically a Nobel Prize, it is identified with the award and the winners are announced with the Nobel Prize recipients, and the Prize in Economic Sciences is presented at the Nobel Prize Award Ceremony. ^ Per Indian nationality law, Article 9 of the Indian Constitution says that a person who voluntarily acquires citizenship of any other country is no longer an Indian citizen. Also, according to The Passports Act, a person has to surrender his Indian passport; it is a punishable offense under the act if he fails to surrender the passport. Hence, citizenship exclusively includes jus sanguinis (citizenship by right of blood). ^ Kasturi, Charu Sudan (25 August 2013). 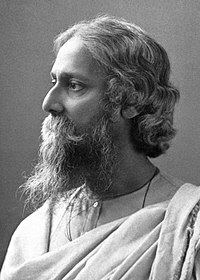 "Nobel tribute to Tagore - Stockholm to Calcutta, Sweden lines up centenary events". The Telegraph India. Archived from the original on 5 December 2018. Retrieved 5 December 2018. ^ a b "Nobel Prizes–Britannica". Encyclopaedia Britannica. Archived from the original on 29 April 2015. Retrieved 7 November 2018. ^ "The Nobel Prize". Nobel Foundation. Archived from the original on 22 June 2013. Retrieved 7 November 2018. ^ "A short guide to the Nobel Prize". Swedish Institute. 7 December 2018. Archived from the original on 24 January 2019. Retrieved 27 January 2019. ^ Media, Nobel (22 November 2018). "Nobel Prize facts". Nobel Foundation. Archived from the original on 6 November 2018. Retrieved 22 November 2018. ^ "From 1913 to 2014: Indian Nobel Prize winners". The Hindu. 10 October 2014. Retrieved 14 November 2018. ^ Rajinder Singh (September 2012). "Aurobindo Gosh's Nobel nomination". Science and Culture. p. 442. Archived from the original on 8 August 2016. Retrieved 7 November 2018. ^ Media, Nobel (22 November 2018). "Aurobindo Ghosh Nomination archive". Nobel Foundation. Archived from the original on 22 November 2018. Retrieved 22 November 2018. ^ Levinovitz, Agneta Wallin (2001). The Nobel Prize: The First 100 Years. London: Imperial College Press, London. pp. 181–186. ISBN 9789810246655. ^ Tønnesson, Øyvind (1 December 1999). "Mahatma Gandhi, the Missing Laureate". Nobel Foundation. Archived from the original on 2 June 2017. Retrieved 7 November 2018. ^ Ghosh, Avijit (17 October 2006). "We missed Mahatma Gandhi". The Times of India. Retrieved 5 December 2018. ^ Wolchover, Natalie (10 May 2011). "No Peace for Gandhi". NBCNews. Archived from the original on 7 December 2018. Retrieved 6 December 2018. ^ George, P J (10 October 2014). "List of laureates". The Hindu. Archived from the original on 12 November 2017. Retrieved 4 May 2015. ^ "Indian Citizenship". indiacode.nic.in. Archived from the original on 11 January 2015. Retrieved 7 November 2018. ^ "Rabindranath Tagore". Nobel Foundation. Archived from the original on 11 June 2017. Retrieved 7 November 2018. ^ "C V Raman". Nobel Foundation. Archived from the original on 17 September 2015. Retrieved 7 November 2018. ^ "Mother Teresa Agnes". Nobel Foundation. Archived from the original on 11 June 2017. Retrieved 7 November 2018. ^ "Press Release 1979 Peace". Nobel Foundation. 27 October 1979. Archived from the original on 24 January 2019. Retrieved 24 January 2019. ^ "Amartya Sen". Nobel Foundation. Retrieved 14 November 2018. ^ "The Nobel Peace Prize 2014". Nobel Foundation. Archived from the original on 10 June 2017. Retrieved 7 November 2018. ^ "H. Gobind Khorana". Nobel Foundation. Archived from the original on 1 June 2017. Retrieved 7 November 2018. ^ "Subramanyan Chandrasekhar". Nobel Foundation. Archived from the original on 17 June 2017. Retrieved 7 November 2018. ^ "Venkatraman Ramakrishnan". Nobel Foundation. Archived from the original on 14 June 2017. Retrieved 7 November 2018. ^ "Ronald Ross". Nobel Foundation. Archived from the original on 15 June 2017. Retrieved 7 November 2018. ^ "Rudyard Kipling". Nobel Foundation. Archived from the original on 17 June 2017. Retrieved 7 November 2018. ^ "Dalai Lama 14th". Nobel Foundation. Archived from the original on 14 April 2015. Retrieved 8 November 2018. ^ Aarvik, Egil. "Award ceremony speech". Nobel Foundation. Archived from the original on 27 January 2019. Retrieved 27 January 2019. ^ "Nobel Prize in Literature 2001". Nobel Foundation. Archived from the original on 1 February 2016. Retrieved 17 October 2008. This page was last edited on 21 April 2019, at 09:54 (UTC).